The YMCA of the Greater Twin Cities, a leading nonprofit dedicated to strengthening communities through youth development, healthy living and social responsibility, is creating the YMCA Center for Youth Voice that brings together YMCA Youth in Government and Minnesota Civic Youth, two nonpartisan, nonprofit organizations dedicated to preparing young people for a life of informed, active citizenship. The YMCA Center for Youth Voice is founded on the premise that youth voice and participation matter, and that the lives of all Minnesotans will be better when youth participate and help shape their own future. Model Assembly Session is the state’s largest hands-on civics education event, with nearly 1,600 students in grades 8-12 gathering at the State Capitol to replicate the functions of state government. 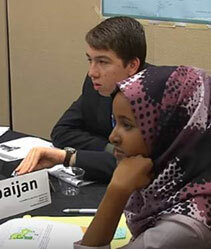 Students gain experience with the process of making or changing laws, trying court cases and creating open government. Model United Nations brings together nearly 800 students in grades 7-12 to represent nations around the world and practice compromise and diplomacy to solve global problems. YMCA Youth Conference on National Affairs gathers more than 600 students from more than 30 states’ Youth in Government programs to discuss ideas that will change and improve the nation and the world. Kids Voting offers an authentic voting experience in which students in kindergarten through 12th grade cast their vote on Election Day at a centralized polling place in their school or community building. In the 2016 election, more than 115,000 students cast a vote. Student Election Judges work as a team with community members to administer elections on Election Day. Students cycle through a variety of roles: greeting voters, helping voters register, checking registered voters in, explaining how to mark a ballot and participating in engaging activities. Youth Day at the Capitol is designed to get young people talking with the legislators about issues that are important to them. This day helps young people to understand that elected officials work for the people, including young people. Respectful Conversations in Schools provides teachers and students with a proven protocol for discussing sensitive or controversial issues. The model is designed to increase students’ civic knowledge, participation and listening skills, and empathy across differences. The YMCA Center for Youth Voice models the Y’s broader belief in inclusion and in intentionally creating spaces where all can learn, grow and thrive. Because the Y is a leading nonprofit committed to helping all have the opportunity to participate, financial assistance is available to those in need.